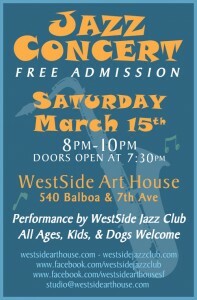 Featuring WestSide Jazz Club with…. 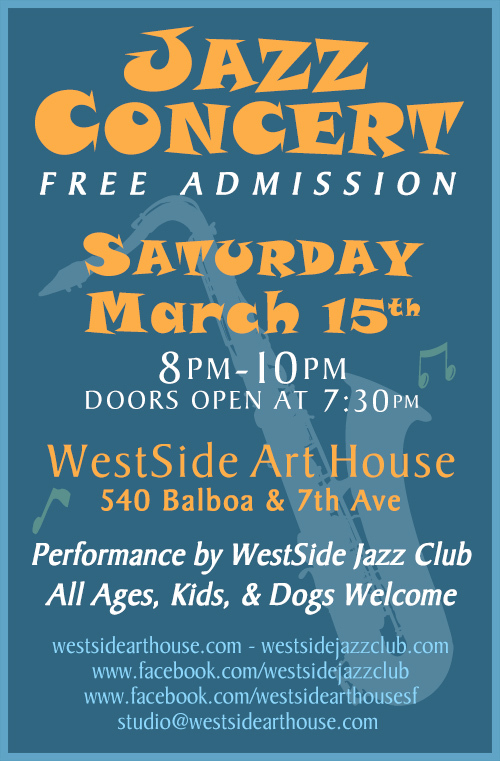 The West Side Jazz Club is a San Francisco-based band seeking to balance modern, innovative jazz music with a solid tradition of small-group bebop. As a trio, quartet, quintet or larger group, WSJC is organic and dynamic in both its members and sound. Founded by tenor saxophonist Scott Silverberg in 2002, WSJC brings musicians from a broad pool of local talent, bringing together players with diverse backgrounds & influences. Part workshop, part showcase and all improvisational, the West Side Jazz Club maintains an expansive, ever-changing book of jazz standards, focusing on challenging modern compositions and freshly-updated classics from Monk to Shorter, through Ellington, Rollins and Coltrane.